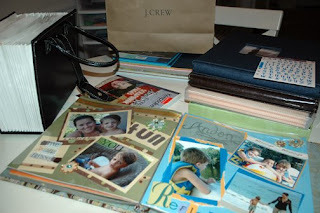 I said in one of my recent posts that I was starting to get caught up on my scrapbooking. I am REALLY behind! 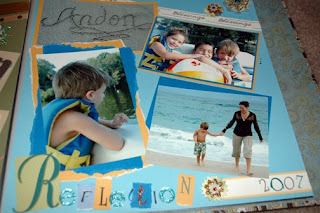 I am just finishing Andon's 3yr. to 4yr. book. Then I'll get started on his 4 yr. to 5 yr. book and then start working on current! I have over 1,000 photos still on memory cards that need to be gone through, cropped and printed. Whew! I took a few photos of the fun pages I did recently. The pictures are not that great but you can still get the idea! 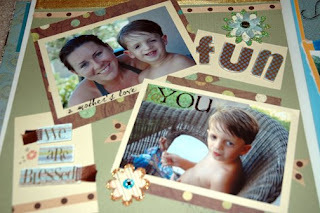 :) And i'm no professional scrapbooker either but I still have fun doing it! Here's all the stuff I have to drag out! 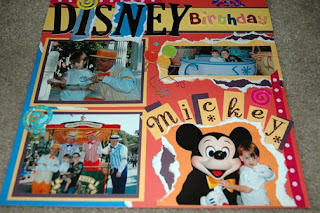 And Andon's 4th Birthday at Disney World. We got to ride down Main Street with the Barber Shop Quartet while they sang Happy Birthday to Andon!! I think Jared enjoyed it more than Andon did! Thanks so much Dan Bullock for making that day so special! 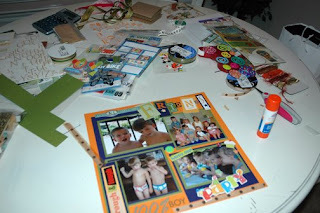 I am SO behind on my scrapbooking!! I am blaming it on not having a dining room table to do it on!! yah, that is it... Have a good rest of the week! You are doing a GREAT job. You are blogging a LOT too...I was so behind I had to read all 3 of your latest posts. Love you and always enjoy what the Lord is teaching you...where is that site with a calendar coded thingy? As I read that post I thought...oh, well, welcome to my life :) I need some color co-ordinating myself!!! 2. your new blog page is BEAUTIFUL! Awesome pages - I wish we could work on them together!